Work to build a brand new Middlesex University campus in Mauritius is underway following the official ground breaking ceremony in Flic-en-Flac. The milestone event was attended by Her Excellency, The President of the Republic of Mauritius, Dr Ameenah Gurib-Fakim, and education minister Mrs Leela Devi Dookun-Luchoomun – who unveiled a commemorative plaque to mark the occasion. 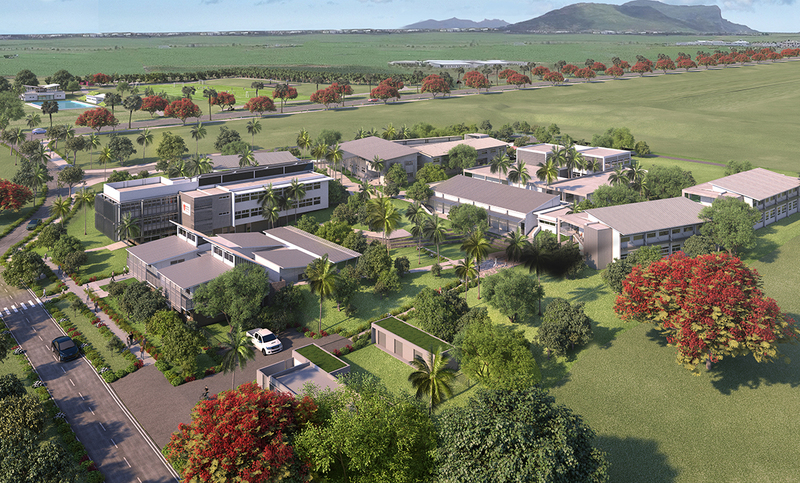 Middlesex University Mauritius has partnered with Medine Group to construct the state-of-the-art campus within the new Medine Smart City development on the west coast of Mauritius. The new campus is scheduled for completion in September 2017 and will replace the existing Middlesex University Mauritius campus. The 8,000m2 site will have capacity for 1,400 students. Among the academic facilities will be cutting-edge IT laboratories, classrooms, lecture theatres, a learning resource centre and extensive study spaces. Leisure facilities will include a brand new sports complex hosting a 50m Olympic pool, football and rugby pitches, gym and fitness centres, a green park and art station as well as new student accommodation. Professor Andrea Dlaska, Middlesex University’s Deputy Vice-Chancellor, Learning and Innovation, is excited about the future of the University’s Mauritius campus. “This ground breaking marks the start of an exciting new era for the University and for higher education in Mauritius,” she says. Thierry Sauzier, Deputy Chief Executive Officer of Medine Group is proud of the range of modern facilities the new campus will offer. “I am sure these facilities will be instrumental in the success of the campus as well as playing an important role in the development of students,” he says. The development of this new campus will not affect current students and staff at the existing campus who will move across to the new facilities when completed.